A midfielder had been a priority for a while and Casper had suggested he was keen on a player from a higher division. That player turned out to be Birmingham's Mark Yates with the 21-year-old costing us £50,000. Six-footer Yates was described as a strong midfield player with a good engine who would add a new dimension to the midfield. He'd already played over 50 league games for Birmingham and had featured in each of their opening two league games, coming on as a substitute in a 3-2 home win against Bury and then playing the full 90 minutes as Birmingham won 1-0 a Fulham. Joining him at Turf Moor was goalkeeper Andy Marriott on a one month loan deal from Nottingham Forest. He'd started his career with Arsenal with Forest boss Brian Clough paying £50,000 for his services. 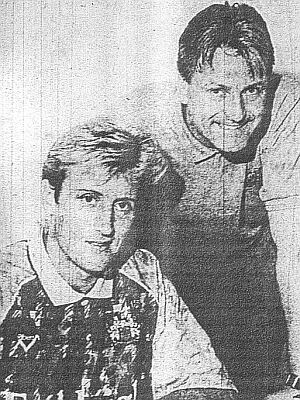 Still to make a Forest debut, he'd played for West Brom, our local rivals Blackburn and Colchester on loan and had been in goal for Colchester in their last game of the 1989/90 season against Burnley at Layer Road, a game Burnley won 2-1. Casper confirmed that both would be in contention for the Doncaster game in two days time with Marriott looking certain to get a first game with regular goalkeeper Chris Pearce having suffered a rib injury.